The TomTom GO 500 has a new user interface that strips away the traditional address entry search process, and its capacitive touch screen is responsive. Safety camera alerts are an optional extra and you'll need to tether your smartphone to get live traffic information, but the GO 500 remains one of the best GPS units we've ever used. The TomTom GO 500 introduces a completely new user interface that strips away the traditional address entry search process, and has a capacitive touch screen that offers pinch to zoom functionality. Safety camera alerts are an optional extra and you'll need to tether your smartphone to get live traffic information, but the GO 500 remains one of the best GPS units we've ever used. There's really only so much you can do with a portable GPS unit so TomTom has naturally kept things pretty simple. The GO 500 has a large 5in screen that features a gloss black bezel, along with a faux, metallic silver finish on the surrounding plastic. The rear of the device has a large grey circle in the centre with a dotted finish, effectively hiding the built-in speaker on the back. The rest of the unit is finished in plain black plastic. It feels solid and study but is otherwise unremarkable. There's a power button on the top of the GO 500 unit, but we would have liked it to be a bit more raised, as it does require a firm press to activate. A microSD card slot, a micro-USB connection for charging, and a dock connector for the included window mount are located on the bottom. The window mount is compact and very easy to attach. It also makes the GO 500 very easy to remove. 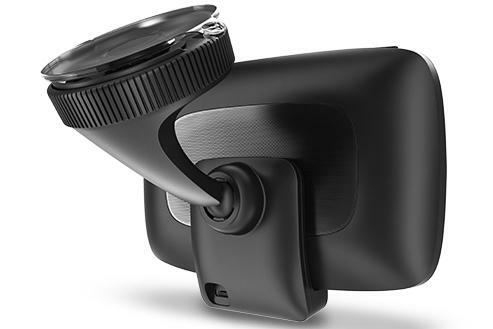 The GO 500's window mount is compact but sturdy, and makes it easy to remove the device. 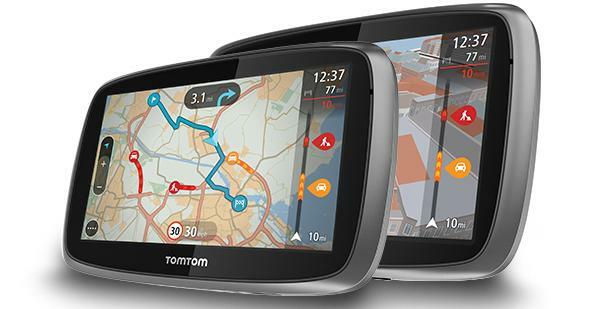 The TomTom GO 500 has a large, 5in touch screen. The company also offers a 6in model (GO 600) which is otherwise identical aside from screen size. The display annoyingly has a glossy finish so it can sometimes be hard to see in direct sunlight, but it does have good viewing angles. The GO 500's touch screen is capacitive and is therefore very responsive to touch. This is a very welcome addition when inputting addresses, or searching for POIs. The responsive screen is aided by very slick software. The GO 500 is one of the smoothest GPS units we've ever used. It takes less than 20 seconds to power on and we didn't experience any lag or delay when using the unit. Unlike some competing devices, the software does not have an annoying delay when inputting text, so searching for a destination is fast and effective. Some screen transitions look a little slow, particularly from the map to the menu and vice versa, but this doesn't affect the overall operation of the device. We did find the font size is a little small, however, and the fact this can't be adjusted in the settings menu may annoy some users. 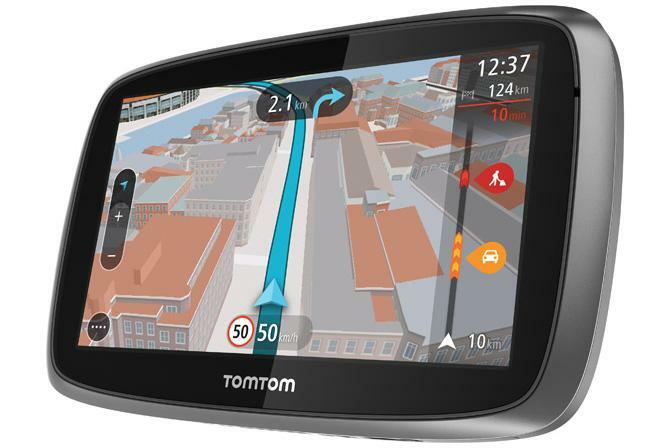 The new software on the TomTom GO 500 is described by the company as being "map centric". This is because the company has hidden the standard "main menu" and instead opted to display the map screen as soon as the device is switched on. Touching and holding on a particular spot on the map screen immediately brings up a pop-up option to navigate directly to that spot, without having to jump to a menu screen. You can also pinch to zoom on the map screen. It's easy to use and pretty straightforward, though we still think most people will search for a destination by entering text. For these people, the key feature is the fact that TomTom has stripped away the traditional address entry search. Instead of a three tier process of searching for suburb, street and house number, for example, the GO 500 has a single search line for all destinations. It's an excellent feature that works well, though some may miss the ability to navigate to a specific GPS coordinate, a feature that's not available. The map screen is clear and has minimal distractions. To enter a destination you simply begin typing and the search screen dynamically displays addresses on the left and points of interest (POIs) on the right. The search function also responds to keywords: it effectively located nearby McDonald's by simply beginning to type "mcdona...". The points of interest database is still significantly less than what you'll find on your smartphone, but the search implementation itself is impressive. Once you've selected a destination, the GO 500 will begin routing. The map screen is very clear and has minimal distractions. A circle icon displaying four dots brings up a menu overlay over the map, while an arrow key cycles through 3D and 2D views, and zoom keys just below it control the map view. A traffic bar on the right side of the screen alerts to approaching safety cameras and the start of any congestion on your route. The menu allows you to search for a new destination, see your current route, including adding stops and changing the route type, view your saved places and recent destinations, and quickly find parking and petrol station POIs. There's also a volume bar at the bottom to adjust the voice volume in this menu, though we wish you could do this on the map screen itself to save an extra screen press. The GO 500 (5in) and GO 600 (6in) units are identical aside from screen size. Voice guidance is clear and comprehensive and the GO 500 includes an Australian text-to-speech voice that deals with pronunciation quite well. Audio is loud and clear, but we found sound from the rear speaker can become a little distorted at full volume. Three New Zealand recorded voices are pre-loaded, which sound very local (they should, they're literally recorded voice samples). However, only the text-to-speech 'computer voices' can speak street names, as having some poor voice actor record every street name in the world is unfeasible. We used a UK English computer voice in New Zealand, which managed to pronounce most street names well. Overall navigation performance is solid, but as with all GPS units, there are still plenty of issues. On one occasion, navigating to an address at Bringelly in NSW directed us to Wallacia, a suburb 10km away. The TomTom maps also missed a number of 'no right turns' on our routes, and while speed signs displayed on most roads, we did encounter various minor roads where they did not appear. We didn't have any such problems driving around Auckland, NZ, even in very new areas where the road layout had changed within the last year. The displayed speed limits were always correct in our Auckland tests, including obscure 40 and 80km/h zones. The TomTom GO 500 has a number of other features including lane guidance, 3D landmarks and free lifetime map updates (four per year). It also comes with live traffic updates and safety camera alerts, but there are catches to both of these features. The live traffic updates require tethering your smartphone's data connection via Bluetooth, while the safety camera alerts are free for the first three months, before requiring an optional yearly subscription of $49.95. Thankfully, we had no issues pairing multiple phones to the GO 500 via Bluetooth, including an iPhone 5, a Samsung Galaxy S4 and a Sony Xperia Z. Windows Phone 7 proved a problem, as it doesn't support Bluetooth tethering. We were unable to test the GO 500 with Windows Phone 8. TomTom says the traffic service will use around 5MB of data per month based on around an hour of use per day. The safety camera feature warns of fixed cameras and red light cameras from TomTom's database, and if connected to a smartphone will also warn you of mobile camera locations. Updating the GO 500's software through the MyTomTom portal. Unfortunately, TomTom's pre-existing ability to correct maps, called Map Share, is still "coming soon" to both the GO 500 and GO 600. The company says it expects to add the feature in a software update in the coming months, but we weren't able to test it during our review. 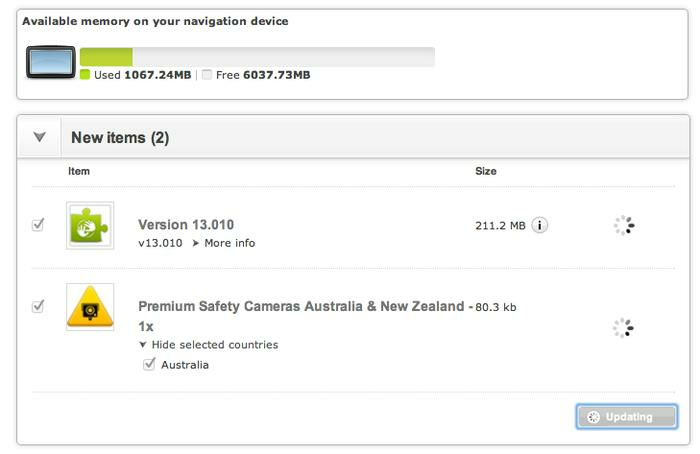 To update the software and download your free map updates, you need to connect the GO 500 to a PC or Mac and download the update through the MyTomTom program. It's relatively straightforward, but the update process is still a bit of an annoyance. The TomTom GO 500 (AU$249/NZ$349) and the TomTom GO 600 (AU$299/NZ$399) are available now through "leading retailers" across Australia and New Zealand.